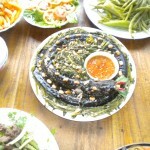 some of the best food I’ve had has been in the Mekong Delta. The two best meals that I believe we’ve had so far was the Women’s Day Banquet at the Ho An Biodiversity Center and then at the house of Mr. Hai. The women brought an unbelievable amount of food out—just when we thought that was all we could eat, the next course would come out. 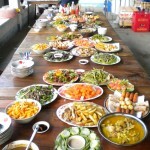 This happened about four times… Spring rolls, plates of vegetables, tofu, rice is the first course. Then, my personal favorite, the Vietnamese curry–peanutty, spicy, and, of your lucky, sometimes has a hidden chicken foot in there. yum! The women’s day banquet was special because, supposedly, only the men cooked. And there were some wild dishes on the table. Like eel and dog, for example. The eel and dog were cooked to compliment each other, like ying-and-yang. I found that usually only the men eat dog in this country, because it is supposed to fill you with strength and fire. However, eel calms and cools you. When I tried to dog, it definitely filled me with SOMETHING, but I wouldn’t say fire or strength… closer to nausea. And sin to… I will miss these cheap smoothies found almost on every corner. I think the avocado or carrot smoothies are my second favorite, after milky fruit smoothie. “Que Sua” is called milky fruit because a) its milky texture and b) it looks like a breast. SO GOOD. My host mother has been buying them for me in the evenings, for medicinal purposes. She claims they cool me down. I am not one to argue with that logic! Attached is a link to a Vietnamese Cooking show with Luke Nguyen who travels through south Vietnam and is having a similar culinary extravanganza like me—but its filmed and in high quality. I’ve only watched the first episode, but there are about five and I’m sure their all worth watching.